In 1896, the East Sanibel School for White Children was built on the corner of Bailey Road and Periwinkle Way and then moved farther up Periwinkle in 1903 where it sat for over 100 years. 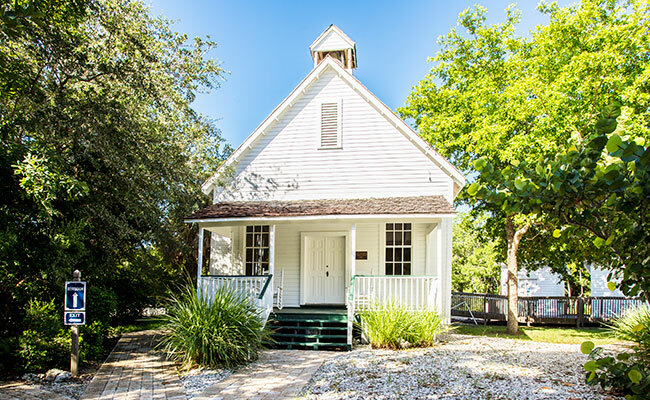 The building, a classic one-room schoolhouse, had a platform in the front where different grades took turns doing lessons with the teacher. In the center was a wood stove used to warm the room in winter as well as to heat soup and cocoa. In 1932, a second room was added, more windows installed, and the schoolhouse was able to house grades one through eight. In the 1960s, after a new school house was built, the building became a theater. In December of 2004, the building was moved to the Historical Village.